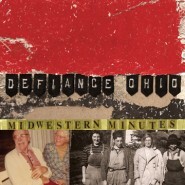 Indie-folk-punk group Defi­ance, Ohio (from Indi­ana), found­ed in 2002, released their third LP, Mid­west­ern Min­utes, on Tues­day. With Min­utes, the band has devel­oped an acoustic take on a range of gen­res into a col­or­ful, well-bal­anced mix. While Min­utes isn’t a per­fect album, it’s def­i­nite­ly one that dis­plays the cre­ativ­i­ty of the band behind it - and it’s cer­tain­ly enjoy­able for that. Two things are imme­di­ate­ly and most promi­nent­ly notice­able on Mid­west­ern Min­utes. The first is that the album is remark­ably out of tune. While punk bands cer­tain­ly have a license to play around with into­na­tion to some extent, the into­na­tion on this album is sim­ply atro­cious. The gui­tar is bare­ly tuned, all the strings dip in and out of tune con­stant­ly, and the vocals are by far the worst of the bunch. While there’s noth­ing wrong with, say, a singer using pitch bend­ing for added depth of sound, when absolute­ly noth­ing is in tune, it’s quite hard to sound at all decent. The sec­ond extreme­ly notice­able ele­ment is, of course, the heavy use of bowed strings (read, not gui­tar). To say this is unusu­al for a punk band is an under­state­ment, and the unique­ness this lends to the album is one of Mid­west­ern Min­utes great­est strengths. Just as impres­sive as the use of strings at all, let alone their extreme impor­tance, is that while Defi­ance, Ohio has in their use carved out a very small and clear­ly defined sub-sub-genre for them­selves, Min­utes is not a repet­i­tive album. Each track is quite dif­fer­ent from the next, some­thing espe­cial­ly impor­tant for an album where a num­ber of the tracks real­ly aren’t all that great. Vocal duties on Mid­west­ern Min­utes are shared by four mem­bers of the band, each of whom con­tributes their own approach, thus cre­at­ing the album’s rich vari­ety of styles. Begin­ning with “Flood Waters“ ‘ sim­ple, rhyth­mic poet­ry-style sound, the album spins (becom­ing a bit dis­ori­ent­ing at times) between styles, as that first track leads into the punk-heavy “The White Shore,” with all vocal edge that implies. From there, the album trav­els along the scale, occa­sion­al­ly find­ing a near-per­fect bal­ance (such as on “Hair­pool”), but often slip­ping into a more clash­ing sound that takes away from the instru­men­tals. It’s also evi­dent across the album that some of the vocal­ists are much more skilled than oth­ers, beg­ging the ques­tion as to why so many of Defi­ance, Ohio’s mem­bers pro­vide vocals to the album. Lyri­cal­ly, Defi­ance, Ohio, is as opin­ion­at­ed as punk has ever been - which is hon­est­ly refresh­ing, com­pared to the mass­es of insid­i­ous­ly banal lyrics on albums with less to say. Lyrics-wise, prob­a­bly the most typ­i­cal­ly “punk” is “The White Shore“ ‘s speech: “I will not con­demn / What any­one did to sur­vive / But I will not defend / A cul­ture that makes us decide / To assim­i­late or die / Or that defines sur­vival / As run­ning as fast as you can from the places you came from.” But as typ­i­cal as the sen­ti­ment may be, it’s hard not to get the impres­sion that Defi­ance, Ohio gen­uine­ly believes in it. Whether the band is draw­ing a pic­ture of the “end times” on “Flood Waters:” “Bod­ies crum­ble ‘bout as fast as a house in the sun / And what you leave behind / Is an uncor­po­re­al mon­u­ment of time,” singing about their band’s ori­gin in Colum­bus, or slip­ping into their less-than-excel­lent lyri­cal moments (“This town is way too small to ever need the bus / So meet me at the pool / That they keep unlocked all night for us”), they’re def­i­nite­ly pas­sion­ate about it. Some­thing very odd hap­pens to Mid­west­ern Min­utes towards its end. “The Rea­son” acts as a very clear­ly defined ful­crum, tip­ping the album head over heels into what can only be described as hap­py punk. It is not, to put it blunt­ly, some­thing that mor­tal ears should ever hear. While the album lev­els out from the com­plete gid­di­ness of “The Rea­son,” that ini­tial shock, fol­lowed by a fair num­ber of all too cheery tracks cer­tain­ly do the album no good. But in the end, how­ev­er scar­ring it may be to those tru­ly opposed to the con­cept of out of tune, hap­py punk, Mid­west­ern Min­utes is def­i­nite­ly a quite unique album, and it still has more good than bad, though the mar­gins may not be all that large.